This is great!! And thank you for the tea bags; I'm sure I'll use them sometimes. I so appreciated your call and our chat; would love to meet you sometime! Excellent customer service!!! 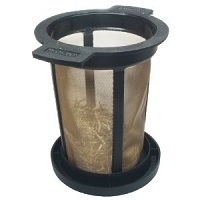 This is a wonderful filter to use with loose teas, and I make a point of sending one along with Lana's teas and tea samples to friends and family. I love this filter, it does an excellent job. I never find small leaves in my tea. I highly recommend this product.